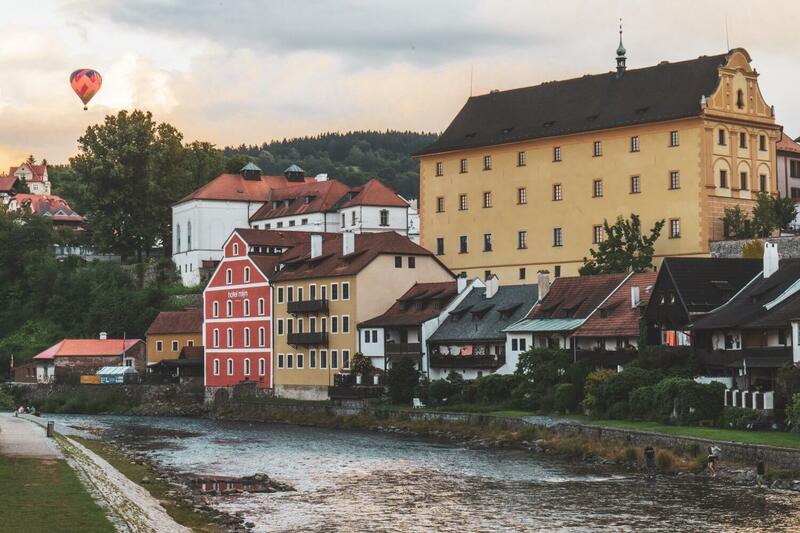 If you’ve ever been on Instagram or Pinterest, odds are you’ve locked eyes with the glory of Cesky Krumlov in the Czech Republic. I mean dayum, who knew towns could be this “swipe right” cute? Built into a beautiful bend along the Vltava River, Cesky Krumlov is famed for its scenic vistas and orange rooftops, enchanting travelers daily who have stopped in search of fairytale vibes, hearty food and… new profile pictures. Obviously. With its giant castle, amazing views and endless parade of charming streets, Cesky Krumlov has a well-earned reputation as one of the best gems in the South Bohemian region of the Czech Republic. After spending some time there, I can confirm: Cesky Krumlov’s magic levels are off the charts. 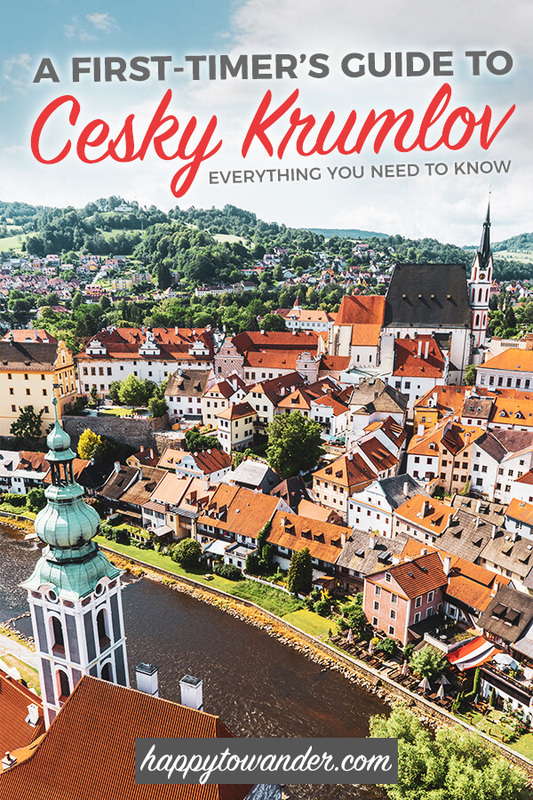 In this guide, I want to walk you through some of the best things to do in Cesky Krumlov, alongside practical nuggets of info like how to get there, where to stay and important must-knows before you visit. NOTE: Unfortunately, there is one attraction at Cesky Krumlov Castle that I strongly disagree with. Right at the entrance of the castle is where you’ll find a “bear moat” that houses a resident bear. Seeing that poor animal in captivity like that really did put a damper on my experience, and while bear keeping is a longstanding tradition of the castle, it’s one I definitely can’t support. Latrán is the charming area just below Cesky Krumlov castle, packed to the brim with beautiful sights like Medieval burger houses, perfect for photographing incessantly. Found on the left bank of the Vltava River, this gorgeously preserved part of the Old Town becomes even more of a time warp at night, when the day trip crowds have scattered and it’s just you becoming one with the cobblestones. 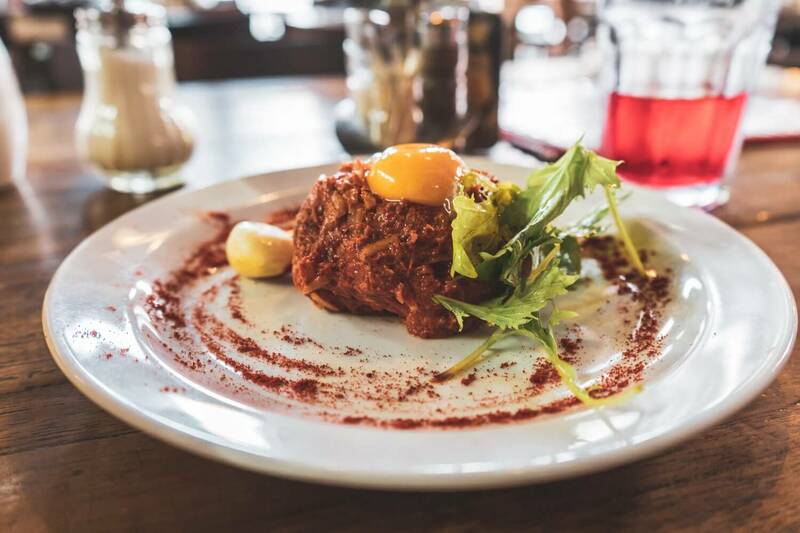 Okay, I’ll be real with you: Czech cuisine is not for the faint of heart (or stomach). 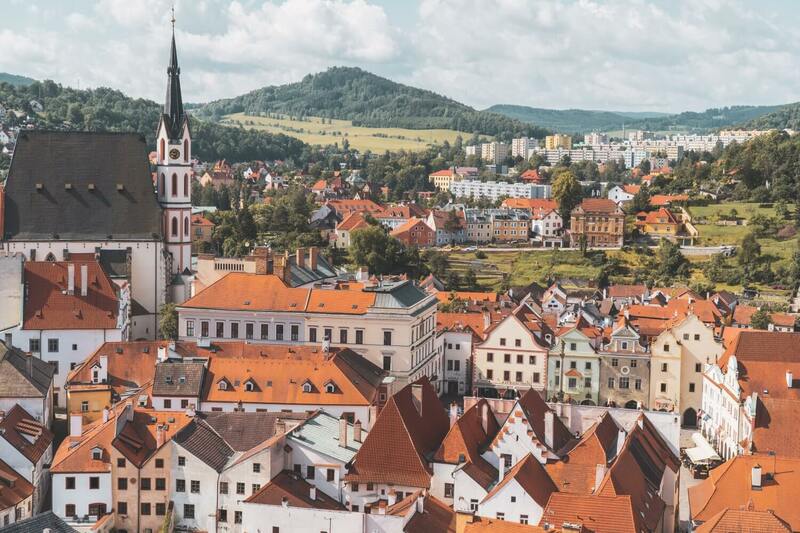 Imagine gluttonous heapings of meat, gut-busting dumplings and all sorts of decadent sauces and gravy to really fatten the deal… but hey, when you’re in Český Krumlov, do calories even count? And if you can feel your arteries clogging just by reading those descriptions, a lighter option is to enjoy some fish! South Bohemia has a lot of fish thanks to its abundance of ponds and zander was a popular feature on every menu we saw. After testing it twice, I can confirm, it’s delicious (and won’t leave you hating yourself). Feeling hungry already? You can scroll down further for my Cesky Krumlov restaurant recommendations. Once upon a time, nine gates were part of Cesky Krumlov’s fortifications. Today, there is only one remaining, and yes (as you’d expect), it’s a very pretty place to stop and stare. 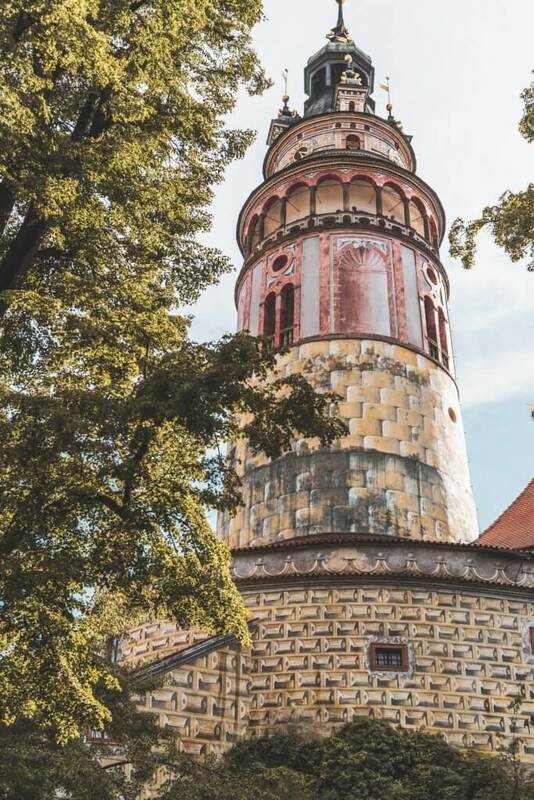 PRO TIP: If you plan on visiting a lot of different museums or attractions during your time in Cesky Krumlov, consider getting yourself a Cesky Krumlov card, which grants you access to 5 museums for a single price. It works out to be much cheaper than buying separate admissions, plus it’s valid for a year and is transferrable. After my visit to Transylvania last year, I’ve kept up an ongoing love affair with Trdelník, a traditionally Slovak treat that is now happily consumed in many Eastern European countries, including of course the Czech Republic. Trdelnik is a sweet pastry that is essentially a tube of grilled dough that is topped with sugar/a ground walnut mix. 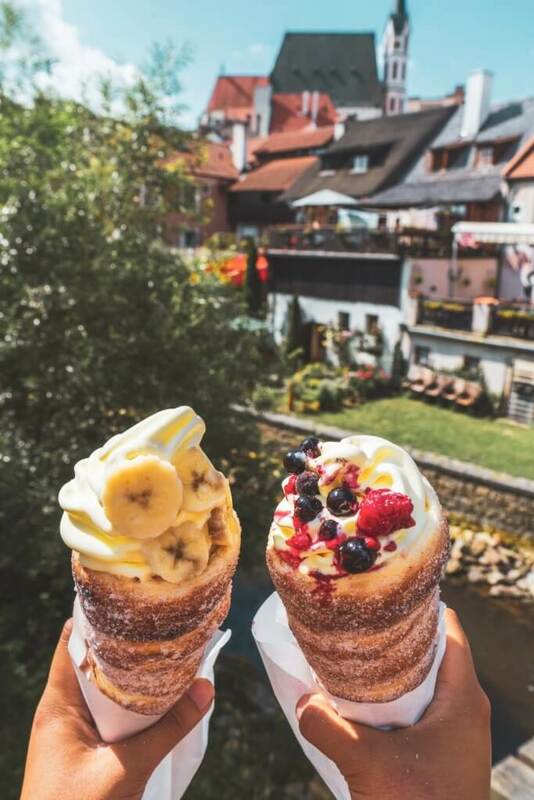 Of course, in the age of Instagram, new variations have taken hold, creating new hybrid desserts like trdelnik ice cream cones. While a bit overpriced, I couldn’t resist grabbing one of these cones for myself just under the castle at an MLS Bistro stand, and let me tell you: they are out of this world. So worth the (relatively) high price tag. The revolving auditorium (an open-air theatre housed in Cesky Krumlov’s castle gardens) is hands down one of the most unique places to watch a play or opera. If you happen to be in town during the summer, try to get a ticket to one of the theatre’s operas, plays or fairytale performances. More info on that here. With every hilly city comes a surplus of excellent viewpoints, and Cesky Krumlov is no exception. Yes, you can actually go rafting in Cesky Krumlov! If you wanted to (and don’t fear death), you can even go at night! Wild stuff. I didn’t have time to try this during my recent visit, but it’s definitely one for the to do list next time. The rentals are based out of Havana Hostel, and they have options for rafting within Cesky Krumlov and longer trips that go to other places in South Bohemia. More details here. Krčma Šatlava: Super unique environment, and delicious food too. 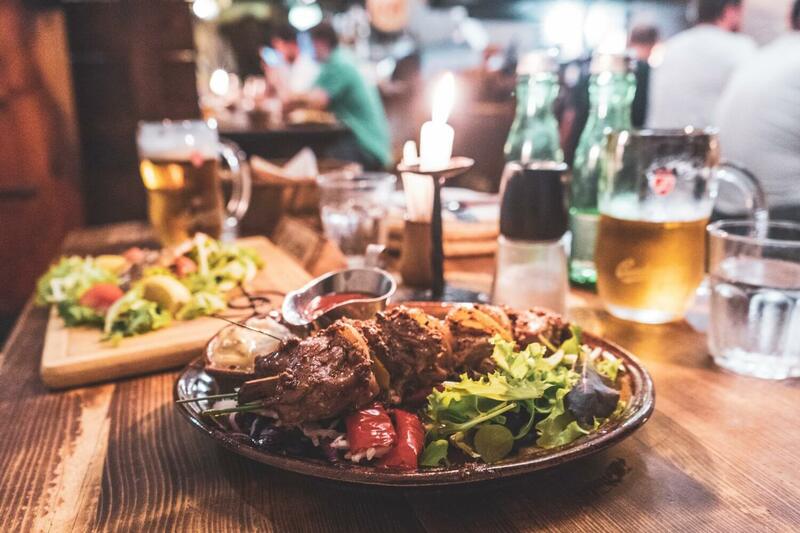 This little tavern will make you feel like you’ve stepped back in time, as you rip into a Medieval feast in a cave, with an actual burly man cooking up meat in a roaring fire. Not the best choice for vegetarians, but a total carnivore’s paradise. Better for dinner as the ambiance is nice at night. DEPO: Tasty food served in a more contemporary/industrial atmosphere. I had lunch here and it tasted awesome, although the service really leaves a lot to be desired. If you don’t mind slow service (and mean muggin’ waiters), definitely stop here for a meal. The beef tartar and pork neck steak are delicious. From Prague to Cesky Krumlov: The best and easiest way to reach Cesky Krumlov from Prague is by bus. Both Flixbus and RegioJet offer this route, so I would use GoEuro (it’s free!) to check for the fastest/cheapest option. NOTE: The easiest and most convenient way to get from Prague to Cesky Krumlov would be to book your own private tour though. This takes any stress out of it and many tours even come with lunch and a guided tour! Click here to browse the options. From České Budějovice to Cesky Krumlov: There are frequent and cheap bus connections that link České Budějovice with Cesky Krumlov. Both Flixbus and RegioJet offer this route, so I would use GoEuro (it’s free!) to check for the fastest/cheapest option. When it comes to where to stay in Cesky Krumlov, there are a ton of different options, whether you’re more into a luxury feel or something cozier and simpler. Here’s a quick rundown of your choices. LUXURY – Hotel Ruze: A 5* hotel with a killer view and widely recognized as the best hotel in Cesky Krumlov. Click here to browse availability and rates. MID-RANGE – Hotel Konvice: A super centrally located hotel that is pretty, but a little on the older side. Reviews rave that the rooms are super spacious. Click here to browse availability and rates. Pensions are a popular accommodations option in Cesky Krumlov. Basically pensions are like guesthouses that provide a room, maybe breakfast/food but otherwise lack hotel amenities like pools, spas, etc. Many of these have sprung up in Cesky Krumlov to accommodate demands in tourism, so they’re basically reconverted houses/apartments. In my opinion, these are perfect because they’re homey, comfortable, and not too expensive either. Plus, who’s really going to hang out in a hotel pool when there’s so much to see? Penzion Delanta: A top-rated pension with free WiFi, free parking & a quieter location about 10min from the main sights in Cesky Krumlov. Click here to browse availability and rates. Penzion Weber: This is where we stayed! Really affordable rates and in a nice quiet neighbourhood (which required stairs/uphill walking from the center). It’s definitely not a luxury place but decent enough, especially considering the low price. Click here to browse availability and rates. Hostel Krumlov House: A homey (non-party) hostel with glowing reviews, housed in a former bakery. Free WiFi, free coffee/tea, free kitchens, etc, all a short walk from the town center. Click here to browse availability and rates. Hostel99: Quirky and cute hostel within the walls of Old Town with their own deli, restaurant and bar. Click here to browse availability and rates. Hostel Postel: Bright hostel with a dreamy riverside location a short walk from the town center and a fully-equipped kitchen with free coffee/tea. Click here to browse availability and rates. If you’re not a fan of crowds, I highly recommend visiting in the Fall or Winter. I’ve had numerous friends who visited during these times and were shocked to see how many people there were from my Instagram stories! I went in early June, which is not yet the height of peak season and even then, by mid-afternoon, the crowds were insane. Do note that many of visitors come in large tour groups for the day, which makes their presence all the more obvious and impossible to ignore. If you do plan to visit during peak season though, my main hack and tip for you is to wake up early. I woke up around 7:30 and got to explore the city a little bit before the crowds settled in. I hit up all the main spots and visited the Castle right as it opened. Even then, there were big groups arriving in the gardens so definitely get up early and do your must-dos first. I would avoid visiting the castle after noon because it just gets so busy. As I previously mentioned, if you plan on visiting multiple attractions or museums, the best way to save money is by getting yourself a Cesky Krumlov card, which gets you admission into 5 attractions for a single price (and ends up saving you about 50% off if you go to them all). Cesky Krumlov is small and easily navigable by foot, but you should know that the very center of the town has no parking. I highly recommend searching up parking lots in advance because street parking isn’t a thing here, and you definitely don’t want to circling around cobblestoned Old Town like a blind rat looking for parking (like we did) – it’s like Grand Theft Auto: Tourist Edition. 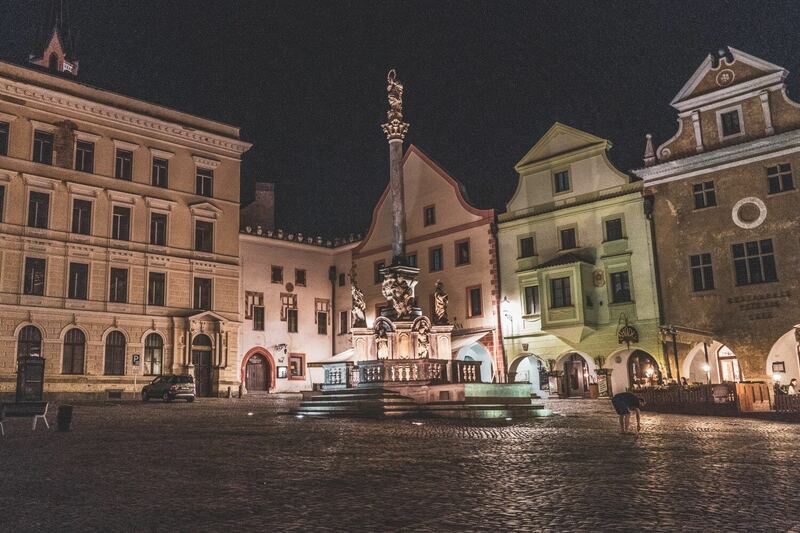 I’ve seen the photos and agree that Cesky Krumlov looks like a place I’d love to photograph and explore. I love that you put in the side note about the bear. But now when I visit I have your handy-dandy guide! 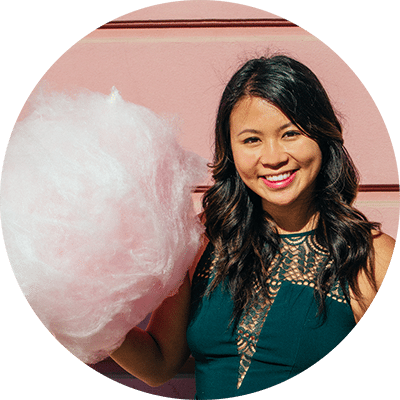 Great post with fab pics, Christina! I love that pensions are an option in Cesky Krumlov—they just add to the charm! Thanks for sharing so many great travel tips on this destination. Wow this really is such a cute place! That castle is so beautiful and really looks like something out of a fairy tale! Fairytale for sure! What an adorable place.Too bad the people don’t sound super friendly, though. Wow! Sure looks like a fairy tale. Will now put it on my list to visit one day. You write the best travel guide. My recent trip to Munich, Germany (Neuschwanstein & Salzburg, Austria) was a success because of your step by step guide. I enjoy reading your blogs.